The Chronicles of Narnia - 2001 publication. The Chronicles of Narnia Box Set: Full-Color Collector's Edition --2000 publication. 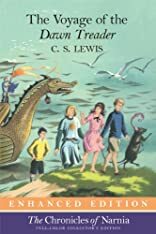 The Voyage of the " Dawn Treader "
Voyage of the "Dawn Treader"
The Voyage of the Dawn Treader was written by C. S. Lewis. The Voyage of the Dawn Treader was published by Collier Books, Macmillan Pub. Co.
4/2/2009 Gail Fattori said: Absolutely awesome and classic. I have been reading this actually over and over again... I leave it in my livingroom and pick it up whenever I can and just flip it open and start reading. I have read each one, and still go back and forth on which is my favorite, but I think I lean the most toward Voyage of the Dawn Treader. Do you ever think there could be stories quite like these? 3/12/2008 Heidi Wasson said: C. S. Lewis was an amazing writer. These adventure stories are the best! I read them over and over.